I'm not even sure if slow cooked Schezwan Beef is a thing, more of an experiment of throwing Chinese ingredients I like into a slow cooker and seeing what happens. What transpired was probably the boldest flavoured dish I have ever cooked. 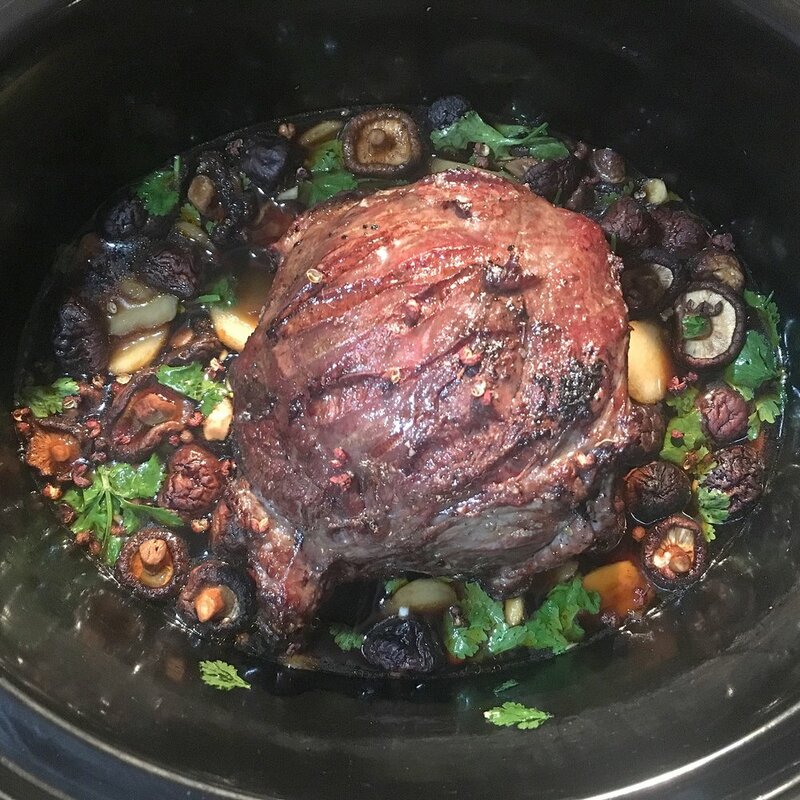 I love slow cooking and when I want slow cooked beef I usually use cheeks, beef with attitude. When cooked low and slow something wonderful happens in that the connective tissue breaks down and the fat content leaves a wonderfully rich and tender piece of meat. Add (a lot of) chilli, sesame oil, garlic, ginger and soy and cook for 8 hours and you produce a piece of meat that is not for the 'plain eaters' out there. Schezwan, the Chinese province, is known it's use of chilli in their dishes and they aren't conservative with their use. To counteract the heat they also use Schezwan Pepper which is wonderfully aromatic and also produces a numbing effect on the palate. You will most likely need to get them from an Asian supermarket along with the Chinese mushrooms which are dried. The mushrooms add another bold earthy flavour further enhancing the richness of the beef. This dish definitely won't be for everyone but if you're a fan of chilli, rich-tasting beef and traditional Chinese flavours give it a go. Such is the nature of cooking with a slow cooker there is very little in the way of actually cooking. However, one thing that does need some heat before placing in the crock pot is the beef cheek. I have talked many times about the benefit of searing meat before slow cooking so ill not bore you as to why this step is necessary, just trust me. So, simply sear the beef well on all sides, preferably on a bbq, and place in the slow cooker with the rest of the ingredients. Set on low and cook for 8 hours. Serve with fried/boiled rice or with soft noodle and garnish with fresh coriander.